A cross section through a mature dicot root gives us a look at its primary structure (fig. 7.8a). A typical dicot root is surrounded by a layer of epidermis cells. The root epidermis usually either lacks a cuticle—a thin coating of wax—or has a thin cuticle that does not significantly affect water absorption. (On leaves and stems, the waxy cuticle helps keep water from evaporating from the plant.) Xylem and phloem cells are packed together in the center of the root. Cortex cells constitute the majority of cells in the root and often store most of the starch (fig. 7.8b). In many plants, the outermost layer(s) of the cortex is a protective layer called the hypodermis, with cells lined with suberin, a waxy substance that is impervious to water. The hypodermis is usually most prominent in roots growing in arid soil or near the soil's surface. Suberin in the hypodermis slows the outward movement of water and dissolved nutrients by as much as 200-fold, thereby helping roots retain water and minerals they've absorbed. How might the hypodermis help a plant live in a dry climate? Most of the cortex consists of thin-walled, starch-storing parenchyma cells separated by large intercellular spaces that can occupy as much as 30% of the root's volume. The innermost layer of the cortex is the endodermis (see fig. 7.8a). Cells of the endodermis are packed tightly together and lack intercellular spaces. Furthermore, four of the six sides of each endodermis cell are impregnated with a Casparian strip made of lignin and suberin and arranged similarly to a rubber band around a rectangular box (fig. 7.9). If endodermis cells are likened to bricks in a brick wall, then the Casparian strip is analogous to the mortar surrounding each brick. The Casparian strip redirects the inward movement of water and nutrients as they flow through the endodermis; water and dissolved minerals must pass through the cell membranes of endodermis cells to reach the vascular tissues in the center of the root (fig. 7.10). As a result, the endodermis functions somewhat as a valve that regulates the movement of minerals into the vascular tissue. This arrangement is critical for helping to eliminate leaks, for conserving certain minerals in the vascular tissue, and to establish a negative water potential (chapter 4) inside the center of the root, the stele. The stele of a root includes all of the tissues in the middle of the root and consists of the pericycle, vascular tissues (xylem and phloem), and sometimes a pith. The outermost layer of the stele is the pericycle, a layer of thin-walled meristem cells one to several cells thick. The pericycle is important because it produces branch roots. This means that branch roots form near the center of the root and then grow outward (fig. 7.11). 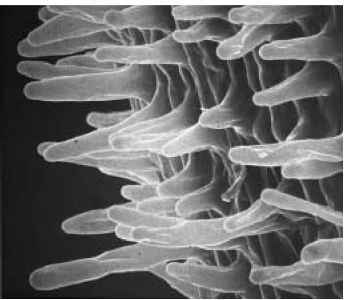 The earliest sign of branch-root formation is cell divisions in the pericycle. Soon thereafter, a root cap and primary tissues form. The branch root then forces its way through the cortex and epidermis of the parent root, much as it will later force its way through the soil. The vascular tissues of branch roots link with those of the parent root. (a) The subapical region of roots includes the zone of cell division, zone of cell elongation, and zone of cell maturation. (b) Scanning electron micrograph of root hairs in the zone of maturation on a primary root of a radish (Raphanus sativus) (X25). Root hairs, which are extensions of epidermal cells, greatly increase the absorptive surface area of the root. Cross sections of the root of a buttercup (Ranunculus). 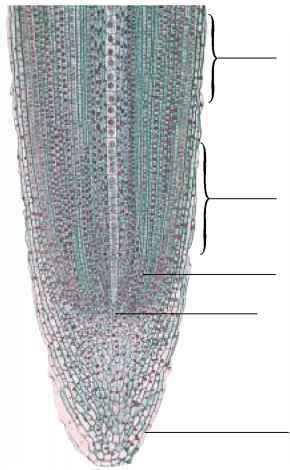 (a) Overall view of a mature root. The stele includes xylem and phloem tissues specialized for long-distance transport of water and solutes, while the epidermis forms a protective outer layer of the root (X10). (b) Cortex cells contain many starch-laden amyloplasts (stained darkly in this micrograph), which are starch bodies, and are usually separated by intercellular spaces (X 220). In many plants, the outermost layer of the cortex is specialized as a hypodermis, which retards the loss of water and dissolved nutrients. Surrounding the root is the epidermis. have a lobed, solid core of xylem in the center (see figs. 7.8a and 7.11). Phloem is found between the lobes of xylem. 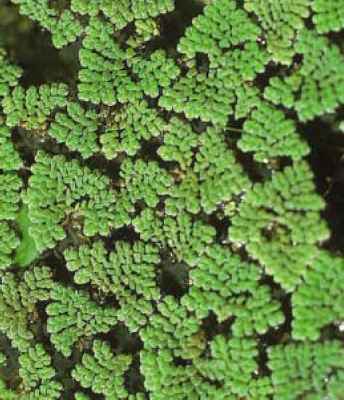 The roots of many monocots and a few dicots have a ring of vascular tissue surrounding a pith made of parenchyma cells (fig. 7.12).